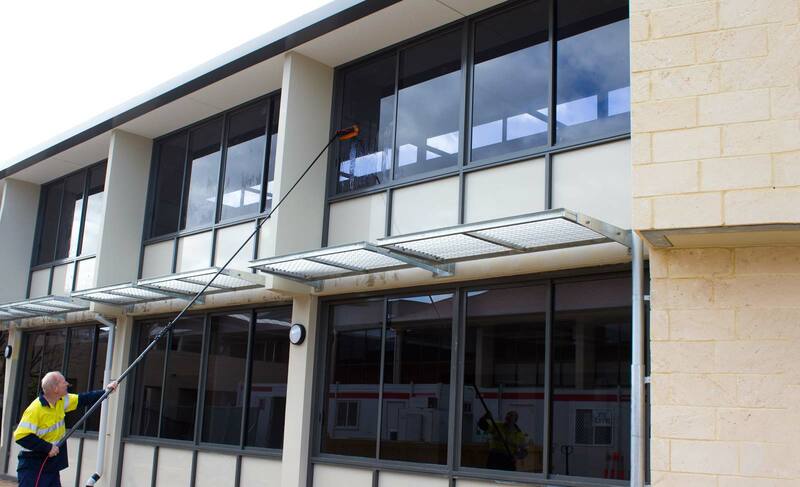 At Old King Cole Window Cleaning in Perth, we service all types of businesses and can cater to all your commercial window cleaning needs. Whether you have a single story retail store, or a multi storey office tower, there’s no job too big or too small for us to handle. With the use of our water fed pole technology, we can reach areas much higher than the standard window cleaning services. We have a National Police Certificate #1676849 as well as Public Liability Insurance of $5,000,000. Cleaning windows, Solar panels, Awkward and high windows. We use Alpha waterfed poles, which not only allow us to reach heights many other window cleaning companies can’t, but they also allow us to give your windows an amazingly thorough clean and sparkling finish. Glass repels water reasonably well but particles of dirt and dust stick to the glass over time and the best way to remove that dust is with a soft brush and pure water. How this works: Resin beads are placed in to the blue cylinder and water is filtered first through a charcoal filter to remove some solids in the water. Then the water passes through the blue chamber containing the resin beads which remove the remaining impurities resulting in 100% pure water. This water is then mixed with a mild drying agent and then fed to a soft brush on the end of the water fed pole. Result. Gleaming windows. No ladders, no walking over your roof tiles to get to high windows and solar panels. We can get around your commercial building as we can work up to 130 metres from a water source. We cater to all kinds of clients, and can perform many other services in addition to commercial window cleaning.